The sport origins can be traced to football matches played in Melbourne,Victoria in 1858, inspired by English public school football games. Australian football has the highest spectator attendance and television viewership of all sports in Australia, while the Australian Football League (AFL), the sport's only fully professional competition, is the nation's wealthiest sporting body. During general play, players may position themselves anywhere on the field and use any part of their bodies to move the ball. The primary methods are kicking, handballing and running with the Ball. Catherine Astrid Salome "Cathy" Freeman, OAM (born 16 February 1973) is an Australian former sprinter, who specialised in the 400 mètres event. She would occasionally compete in other track events, but 400m was her main event. Freeman was the first Australian Indigenous person to become a Commonwealth Games gold mettallist at age 16 in 1990. 1994 was her breakthrough season. At the 1994 commewealht Games in Canada, Freeman won gold in both the 200m and 400 m.
She also won the Wilder medal in the 1996 Olympics and came first at the 1997 World Championships, in the 400 m event. Cathy Freeman began athletics at the age of 2. Her first coach was her stepfather, Bruce Barber. By her early teens she had a collection of regional and national titles, having competed in the 100m, 200 m, High jump and long jump. The emu is the second-largest living bird by heigh. It can be seen in path d'Australia. Emus are soft-feathered, brown,flightless bird with long necks and legs, and can reach up to 1.9 metres (6.2 ft) in height. Emus are dirnual birds and spend their day foraging, preening their plumage with their beak, dust bathing and resting. They are generally gregarious birds apart from the breeding season, and while some forage, others remain vigilant to their mutual benefit. On very hot days, emus pant to maintien their body temperature, their lungs work as evaporative coolers and, unlike some other species, the resulting low levels of carbon dioxide in the blood do not appear to cause alkalosis. 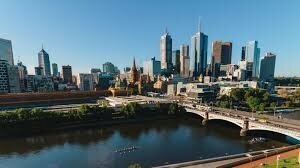 Melbourne is the second capital after Sydney . crown colony on 30 August 1835. The Port of Melbourne is Australia's busiest seaport for containerised and general cargo.